All four titles available now from Darby Creek in paperback, ebook, and library binding. Every summer, the gates of Quartz Creek Ranch swing open for kids in trouble. Under the watchful eyes of lifelong ranchers Willard and Etty Bridle, these ten to twelve-year-olds put their hands—and hearts—to good use, herding cattle, tending the garden, harvesting hay, and caring for animals. 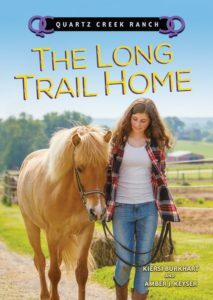 Aided by two teenage horse trainers, the kids must forge a bond with their therapy horses, grow beyond the mistakes that brought them to the ranch, and face unique challenges in the rugged Colorado rangeland. Order at Amazon or your local independent bookstore! Paley Dixon is not excited about six weeks on a horse ranch without access to the virtual world of Dragonfyre. In-game, she’s the Blue Elf, strong and powerful. In the real world, she’s coming off a bad year after moving from Los Angeles to Denver. At least Prince, the majestic horse she’s paired with at Quartz Creek Ranch, makes her feel like royalty. To gain Prince’s trust, Paley has to find her own confidence, which isn’t easy with jerks like Bryce around. When she makes an exciting discovery near the ranch, life finally seems as interesting as Dragonfyre. But to protect her real-world treasure, she’ll have to figure out how to turn courage into action. Rivka can’t wait to get away from her family for the summer. Since that terrible day last year, she wants no part in their Jewish community. At least at Quartz Creek Ranch, she feels worlds away from home among the Colorado scenery, goofy ranch owners, and baby animals. Other parts of Quartz Creek, however, are too familiar, including the unsettling wave of anti-immigrant threats to ranch workers. On a trip to the country, Rivka is also surprised to learn the history of Jewish pioneers in the area. When she and her defiant cabinmate, Cat, face disaster in the wild, Rivka will need to find strength deep within her to help them both get home safely. 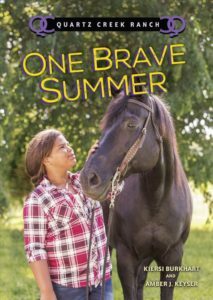 A middle school girl reluctantly experiences the therapeutic power of horses during a summer at Quartz Creek Ranch. When Paley Dixon’s parents abruptly moved the family from LA to Denver just before the start of her sixth-grade year, Paley had trouble making friends and instead retreated into all-night video gaming. Now her parents have stuck her for six weeks of the summer on a ranch full of kids with troubled pasts—and no internet. 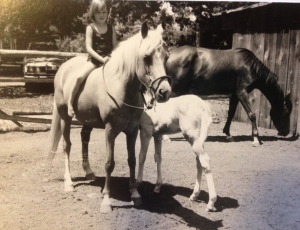 Paley, who along with another camper and a trainer is black, is assigned a beautiful horse named Prince but lacks the self-confidence to lead him, let alone ride him. While she grows to like some of the other campers—there are only five—others send her further into her shell. The owners of the neighboring ranch present some stereotypical conflict, calling the campers “delinquents.” (None of them has done anything particularly terrible.) A more unusual dilemma comes when the campers find a fossilized dinosaur skeleton and must work together to protect it from harm. This is series fiction, but it’s a step above the usual breathless horsey fare, with well-drawn characters and realistic horse situations. Most notably, they’re not all white or girls! 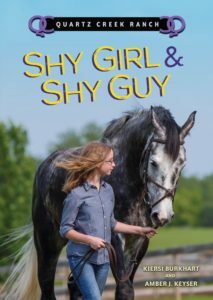 Fearful, white Hanna, a girl who copes with her overcritical parents by stealing, is the featured protagonist among a different but similarly diverse group of campers in the simultaneously publishing Shy Girl & Shy Guy. 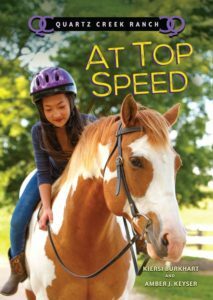 A good book to hand out to horse-crazy kids.